Grows to 1.5m in grassy places, especially on lime, in most waste places, but in the North and West favours the coast mostly avoiding inland areas. 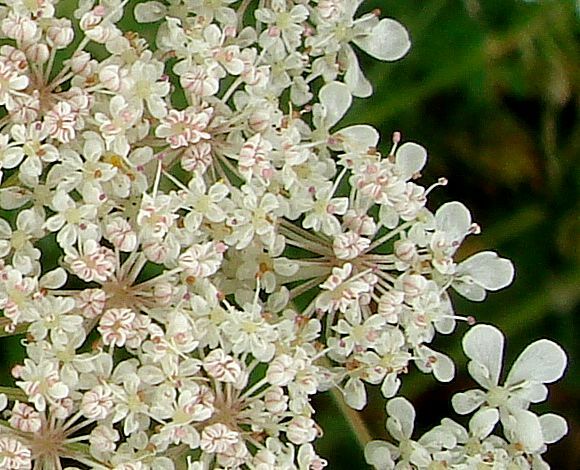 An umbellifer with white (sometimes pinkish) flowers. Has narrow bracts underneath the umbel. 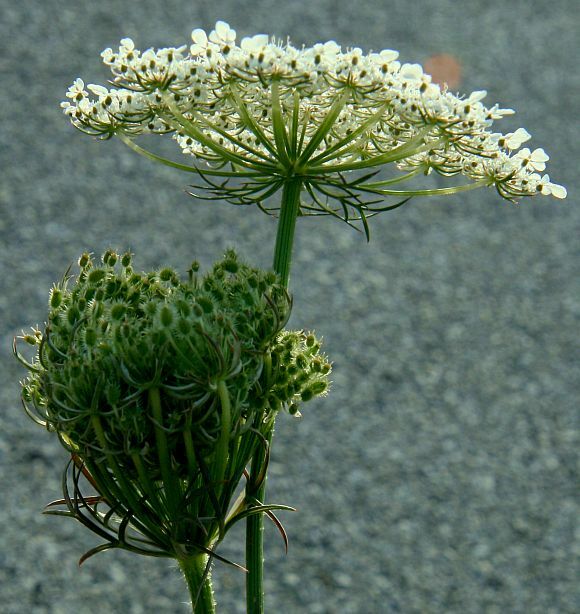 The umbel is 2-umbellate (an umbel of umbels). Flowers yet to un-fold. 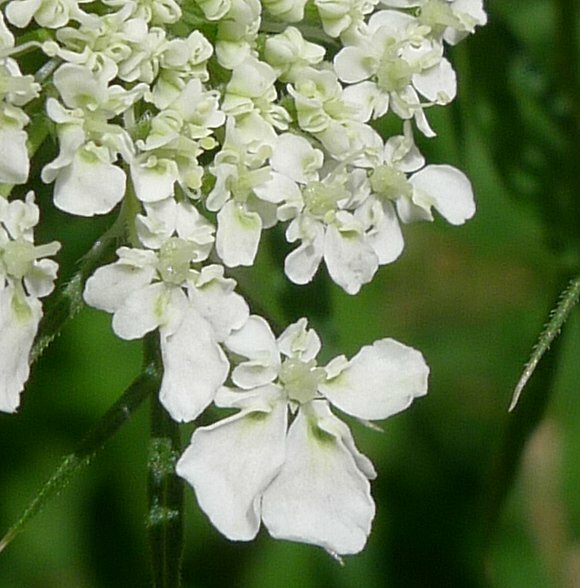 The only common white umbellifer with narrow and forked or pinnate bracts under the umbel. 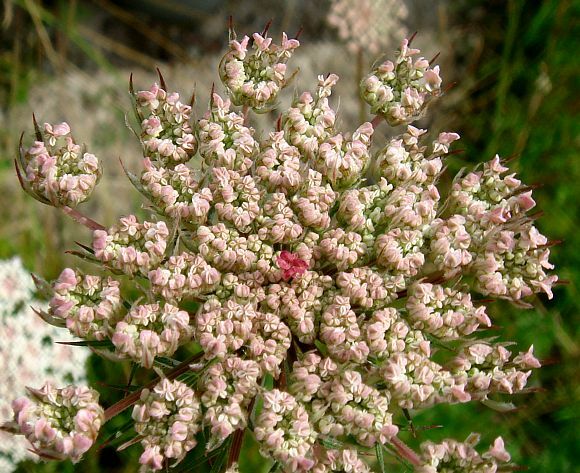 An unusually pink and red umbel. 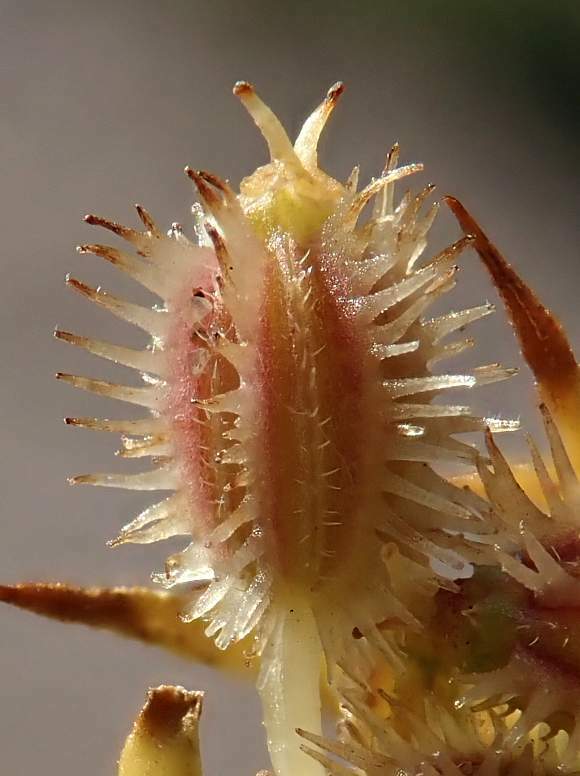 The stems are solid, stiff round and ribbed. 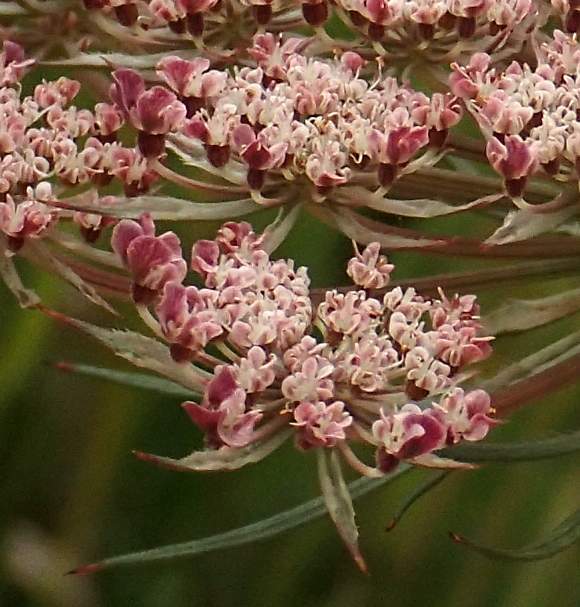 Distinctive tri-forked bracts beneath the umbel. 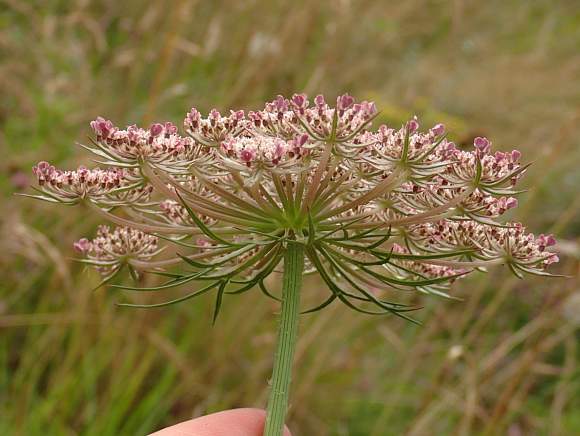 In the centre of many flower umbels is a solitary red or pink flower, a definitive feature for Wild Carrot, although not all specimens possess this element. 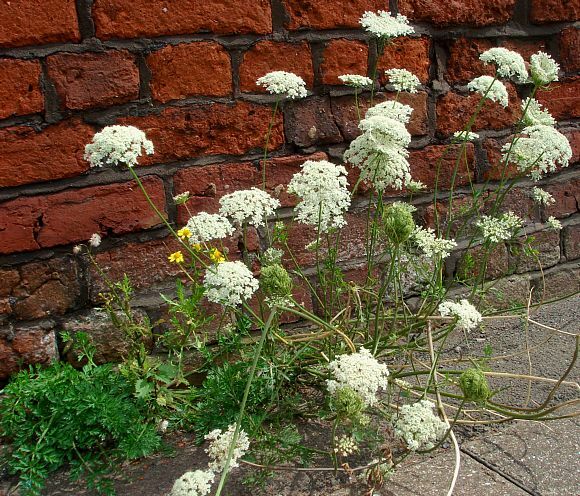 As with many other umbellifers, such as Hogweed, the petals are larger on the periphery of the umbel. Flowers yet to open fully may be pinkish. 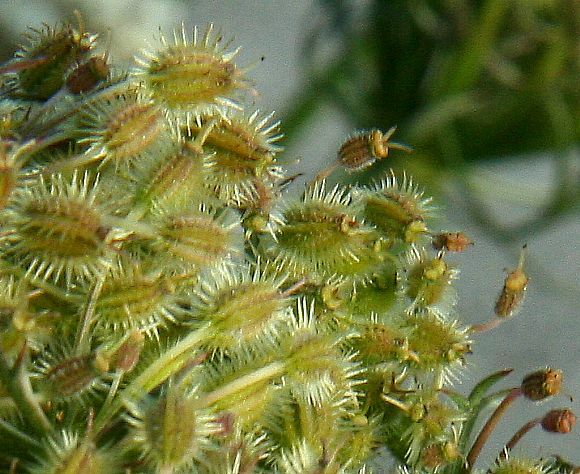 A few sub-umbels, each with a set of sub-bracts underneath. 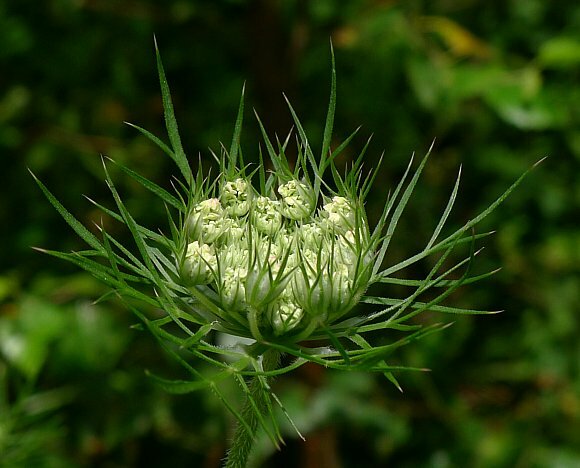 A sub-umbel, of which there are many in the umbel. 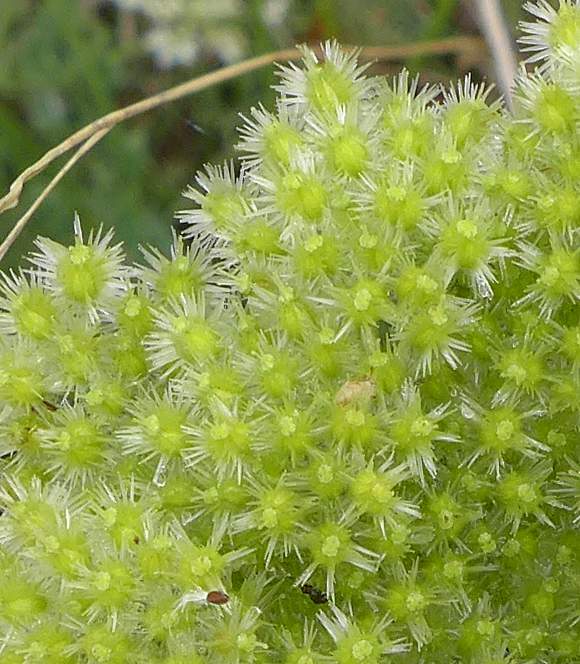 Each flower has five petals and is highly zygomorphic, especially if the floret is on the periphery of the umbel. It is easier to see the two white styles on the pink/red flowered specimen. Petals are not fully opened but still folded in two down the main axis. 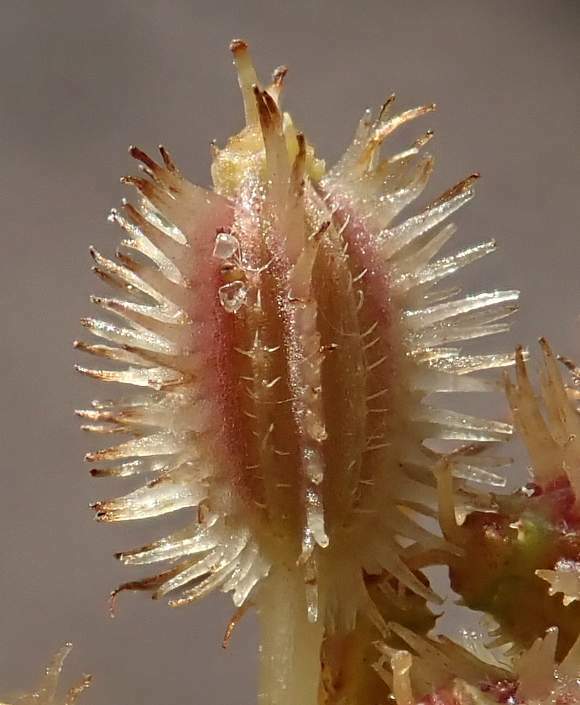 Several anthers visible. 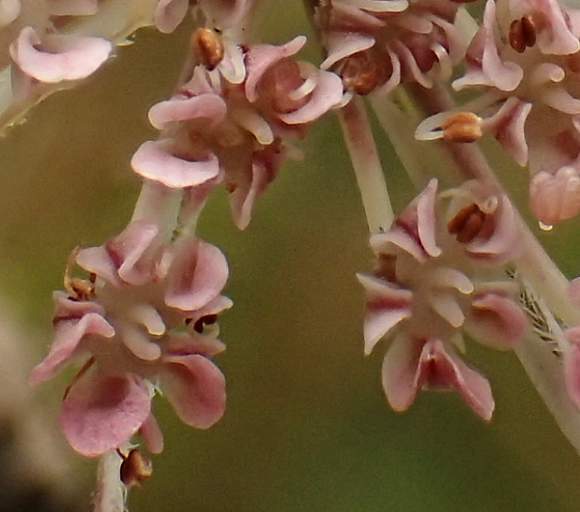 The umbel of umbel structure is discernible when the flowers are yet to fully open. In the centre of many flower umbels is a solitary red or pink flower. 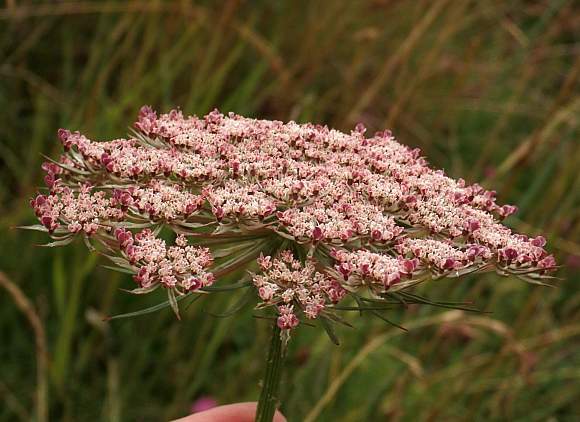 Like other Carrots, such as Sea Carrot, in the centre of many flower umbels is a solitary red or pink flower. Closer inspection reveals that there are sometimes more than one small red flower at the centre. 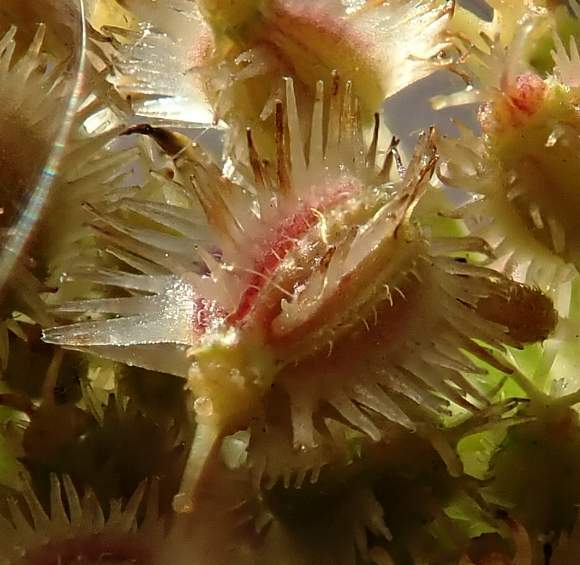 A sub-umbel from underneath showing the hairy ribbed ovary just below the flower. After flowering and before it starts to curl in on itself. The still green ovaries are covered in stiff radiant white hairs making a halo around each one. The two stylopodiums are still present, the paler green semi-circles in the centre each supporting a concolourous style which slightly diverge from one another. 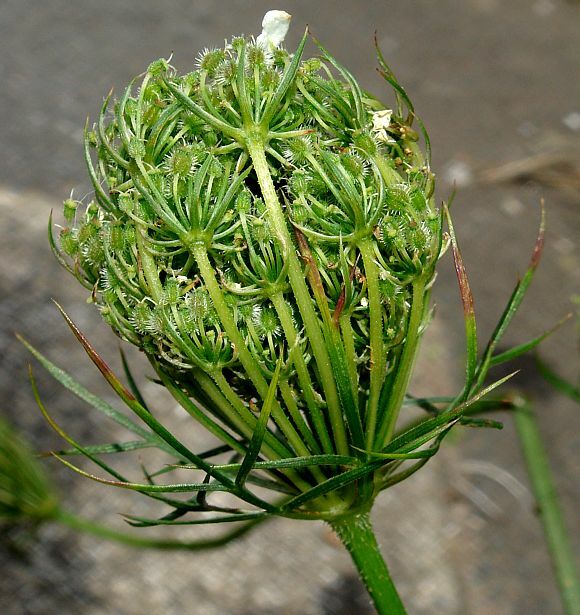 When going to seed, Wild Carrot curls up the stalks bearing the umbels into a ball. (The seed head on the coastal sub-species Sea Carrot, rather than curving inwards into a rugby ball, curves outwards and downwards - not shown). 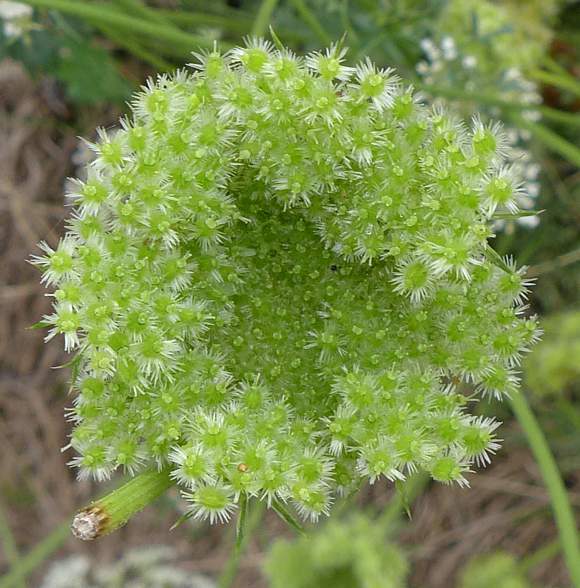 After flowering, the umbel curves upwards and inwards on itself into a ball. The fruits are gathered in a compact bunch near the top. Fruits have several wings from which many hooked spines project. Some fruit are redder than others. 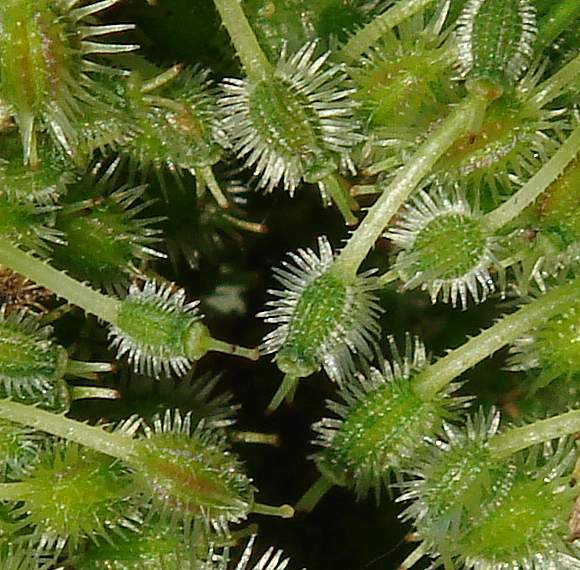 The small white stylopodium disc is at the top, replete with a pair of short styles curving away from each other. There are several ridges on the fruit, some bear long, stiff tapering hairs whilst others bear much shorter and much thinner hairs. Leaves hairy and often grey-green. Leaf stems also hairy, and moreover, ribbed. Similar to : A great many other umbellifers, apart from certain unique characteristics itemised below. 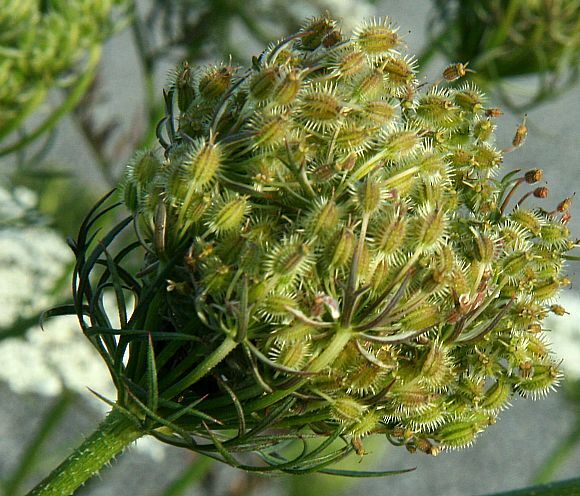 Many similarities to: Sea Carrot, but that is stouter and stockier, usually with an umbel that is almost globed, where the bracts under the umbel are wider, the fruits do not curl up into a ball but are flat instead, has darker-green leaves and only grows near the sea. Sea Carrot (Daucus carota subsp. 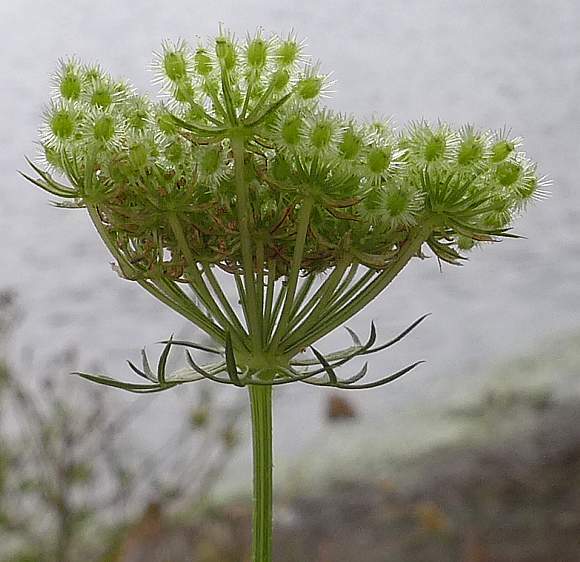 gummifer) umbels not contracted in fruit. Root not swollen. Grows near the coast in the South and South-west on the mainland Britain, and on the coast of SE Ireland. Only the last, Carrot , has roots which swell in the first year called carrots. It is cultivated in gardens, allotments and grown as a crop plant by farmers on the Sefton Coast and inland in Lincolnshire and Norfolk. Eaten by people and rabbits. 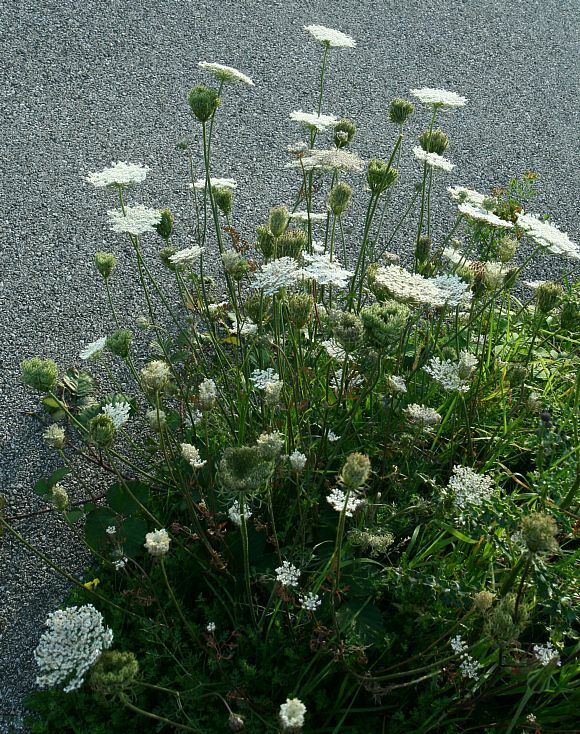 Wild Carrot and all its sub-species are distinguished from other Umbellifers by their unique tri-forked or pinnate bracts around each umbel of umbels. Some similarities to : the rare Bladder-seed (Physospermum cornubiense) which has similarly shaped leaves, but they are of a lighter green. 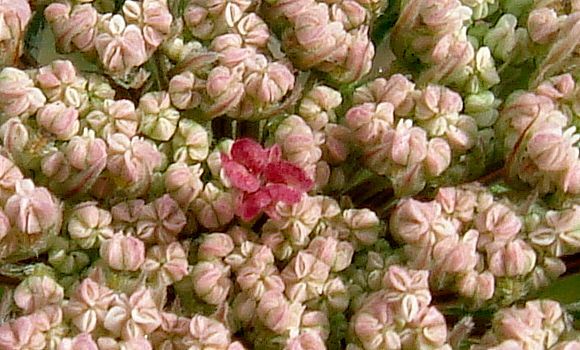 In the very centre of the umbel of flowers lies a single but small pink or red flower (not always present) set amongst all the white ones (but Sea Carrot also has this feature). 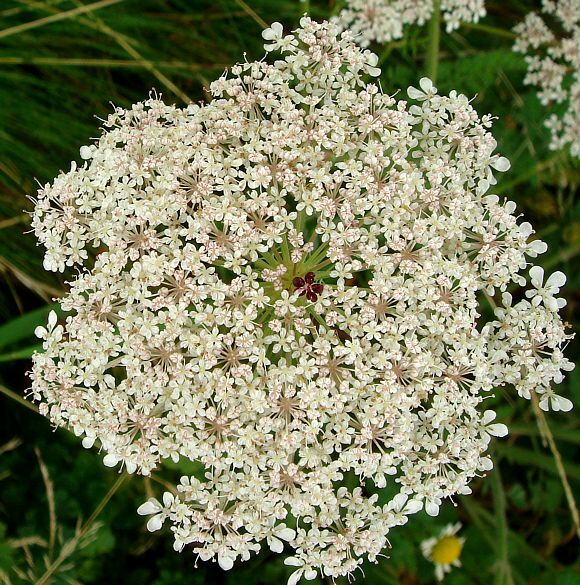 However, the red flower at the centre may not be exclusively indicative of Carrot; some other umbellifers may have one such as Angelica . 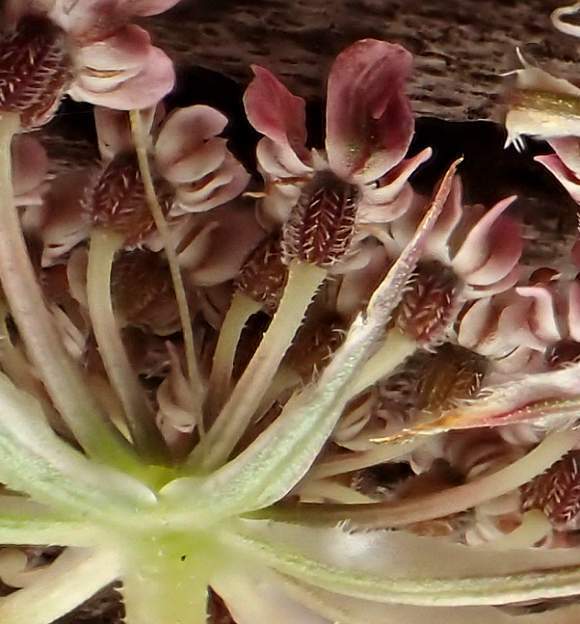 Distinguishing Feature : Once the flower umbel has flowered, the whole umbel curves upwards and inwards upon itself into a tight ball of stems and fruits. Sea Carrot does not do this. 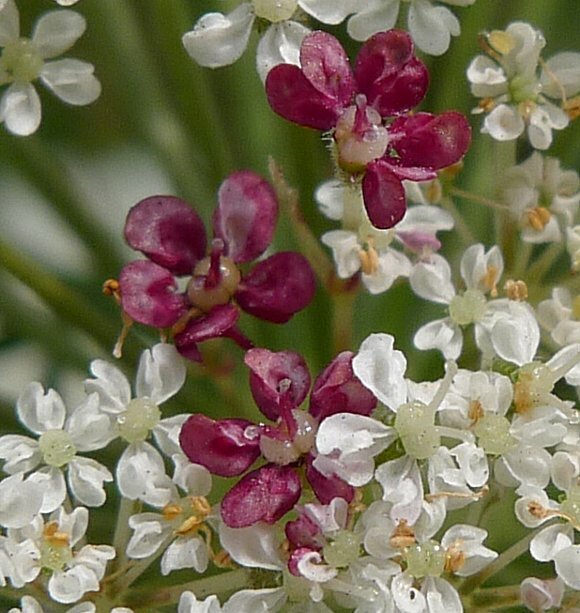 When the flower umbel first opens, the flowers are pink, but gradually turn white as the flower matures apart from one or two in the very centre which turn a darker shade more like that of claret wine. The remaining red one(s) are thought to help attract insects to aid pollination. The leaves smell pungent when crushed. 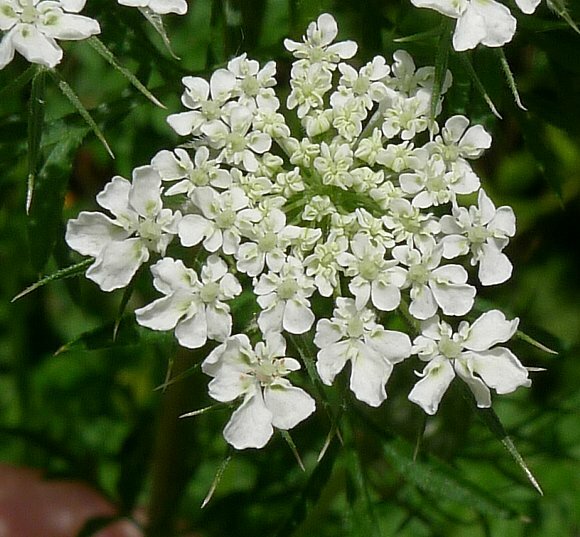 Although the outer petals of the outer flowers in the umbel have larger petals, so too do a number of other umbellifers, so this feature alone is in-sufficient for identification. The roots, just like garden carrots, are rich in carotene and vitamin-C but are not orange-coloured, they are white. Cultivated carrots were originally as purple as beetroot, but those were bred out in favour of orange carrots, but other colours are nowadays making a come-back. Carotene, an orange dye, can be obtained from the roots. Carotene is present in, and responsible for, the colour of a number of other vegetables, including tomatoes and beetroot, but in the case of the latter two, is not the only dye present, and in the case of Beetroot is not even the dominant dye. Carotene comes in two main forms, β-carotene and α-carotene, although other forms exist. It is a good anti-oxidant. Carotene has an important role in photosynthesis. Vitamin A, Retinal, is also produced within the roots of carrots, being half of carotene, but with a terminal hydroxyl group. 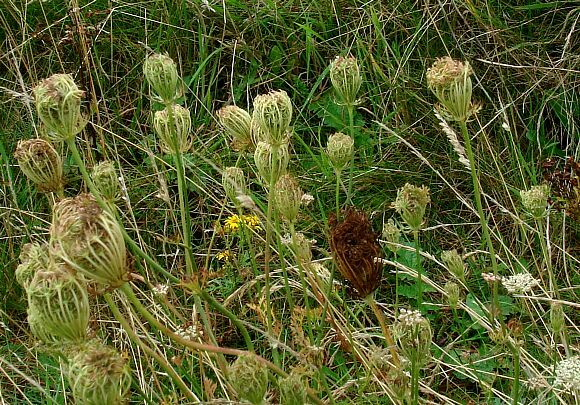 A neurotoxic polyacetylene called Carotatoxin is found in Wild Carrot at a concentration of 2mg/kg weight, and is similar to other polyacetylenes Cicutoxin and Oenthotoxin which also have 17 carbon atoms and which are found in some other Umbellifers (Apiaceae). It is also to be found in cultivated carrots, but is not normally a problem for consumers (and in any case, it is likely that the amount of polyacetylenes in cultivated carrots has been bred to be lower than that found in Wild Carrot. It has been demonstrated that the polyacetylenes present contribute to the bitter taste of carrots. 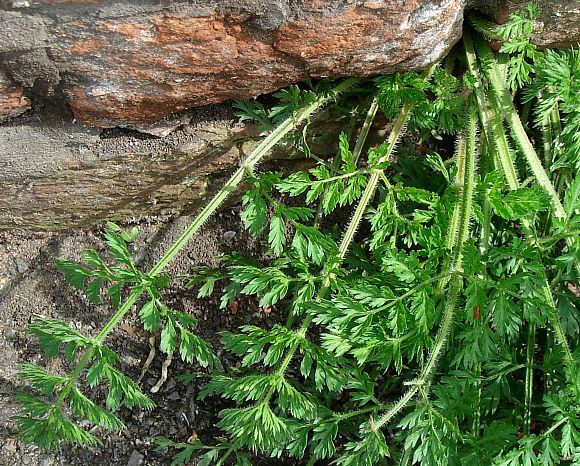 Besides Carotatoxin, four other polyacetylenes occur widely in Apiaceae and Araliaceae species; being Falcarindiol, AcetylFalcarindiol Falcarinol, and Falcarinolone, all of which are present in Carrots (and Wild Carrot), although the Falcarinolone may be present only as an artefact derived from the auto-oxidation of Falcarindiol. 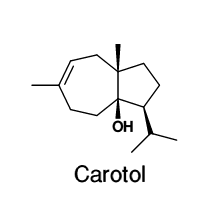 Carotol is an aromatic sesquiterpene alcohol present in the seeds of Carrot at about 40% - 50% concentration. Within the seeds it may be involved as an anti-fungal, herbicidal and insecticidal agent. It consists of two fused rings, one 5-membered, the other 7-membered, with several side groups and an -OH moiety. 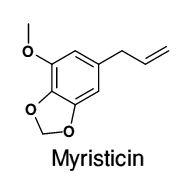 Myristicin, a phenylpropanoid, is also present in Carrots, Parsley and Dill but occurs in much larger amounts in Nutmeg . It is a naturally occurring insecticide and aracicide and also has anti-cholinergic effects discernible when raw Nutmeg is eaten and is the chemical responsible for the toxic properties of Nutmeg. 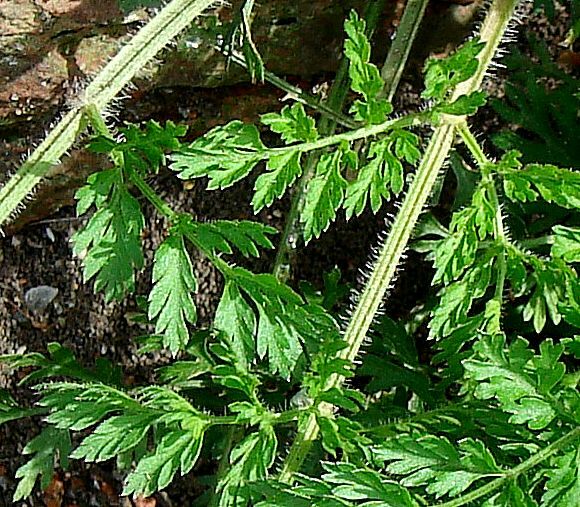 It is chemically similar to Dillapiole which is found in Dill and Fennel.